As many products that originate in foreign lands, I was initially unaware of what Biscoff actually was before purchasing this product. They’re a small cookie that features sweet blend of cinnamon and caramel flavor that are great with coffee and let you sip and extend your pinky in proper sipping fashion. Now take that a step further: this spread is literally pulverized cookies in spreadable form so you can forget about even using those jaw muscles you have and the arduous task of eating cookies one bite at a time. 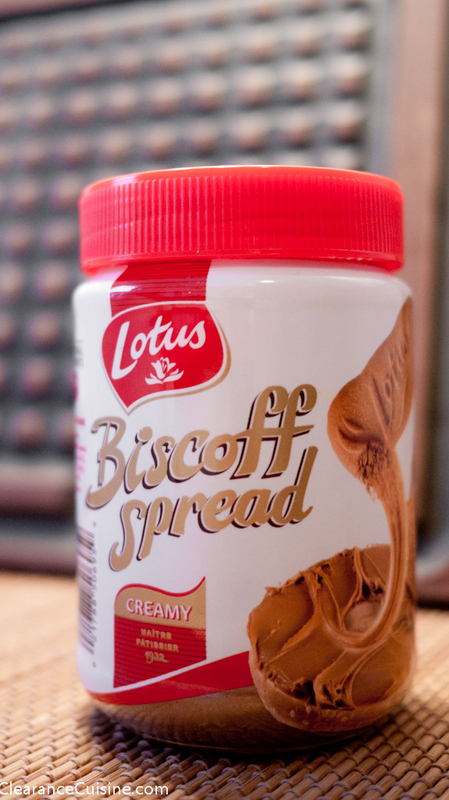 The label/jar even suggest the truly outrageous idea of dipping a Biscoff cookie into Biscoff spread for a Biscoff explosion of flavor. Since it mainly consists of dairy & egg-free cookies and oil for smoothing it all out, Biscoff Spread is also vegan and nut-free (it’s the same color as peanut butter but don’t be fooled). Everyone can enjoy sweet European indulgence! They also have a crunchy variety but I have yet to locate it in any local stores (hint to PR folks at Biscoff reading this). You know how all the Nutella commercials have kids spreading the stuff on bread, waffles and other bland breakfast items? You don’t do that with Biscoff. You take a huge dollop directly from the jar and savor that while you veg out in front the computer or couch. 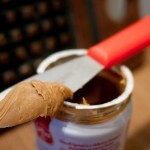 Trader Joe’s actually featured a very similar seasonal product recently for Winter 2011 called Speculoos Cookie Butter. It’s the same concept using traditional European Speculoos cookie and pulverized into a creamy spread. 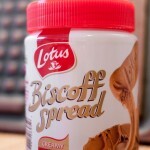 If you can’t find Biscoff spread, I would suggest seeing if you local TJs has it. It’s been rumored it’s been reappearing…plus anything worthy of a Facebook Fan Page must be in high demand (Biscoff Spread also has one too). This entry was posted on Tuesday, April 10th, 2012 at 8:00 am	and is filed under Food. You can follow any comments to this entry through the RSS 2.0 feed. Both comments and pings are currently closed.